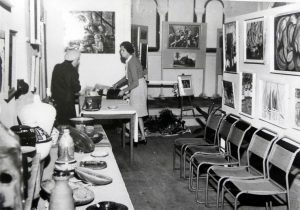 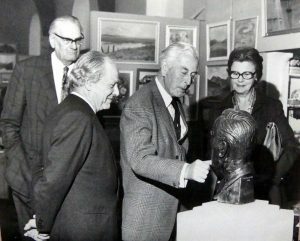 Earl Mountbatten, president of Romsey Art Group, opens the autumn exhibition 1970. 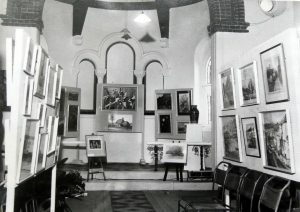 By now the number of artists in the group had risen sharply and exhibits had risen to 344. 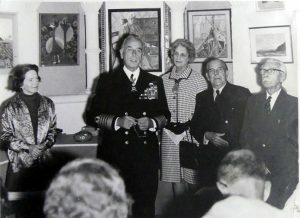 Pictured with the Earl, left to right, are founding chairman Patience Nicholson, Aldwyth Wellington (a past Mayor of Romsey), well-known artist Montague Dawson and the group’s treasurer Col. Jones.